Summer in the northeast United States is a time for a bounty of life forms, little bugs munching leaves and landing out of nowhere in our midst and tiny weeds decorating “waste” places trying to show us that life can be lived in the most unassuming of places. Seemingly they have come from nowhere and humbly they will disappear at frost. Having a minor reputation in my neighborhood as a naturalist, I am presented with various creatures for ID, and then one simply fell into my lap (precisely speaking, onto my page), and then there is the case of the striking stranger that came for the cat food. I write about them in the spirit that the least among us deserves recognition and has a story to tell–part of the Big Story of Life on Earth. Burying beetle on my kitchen counter. 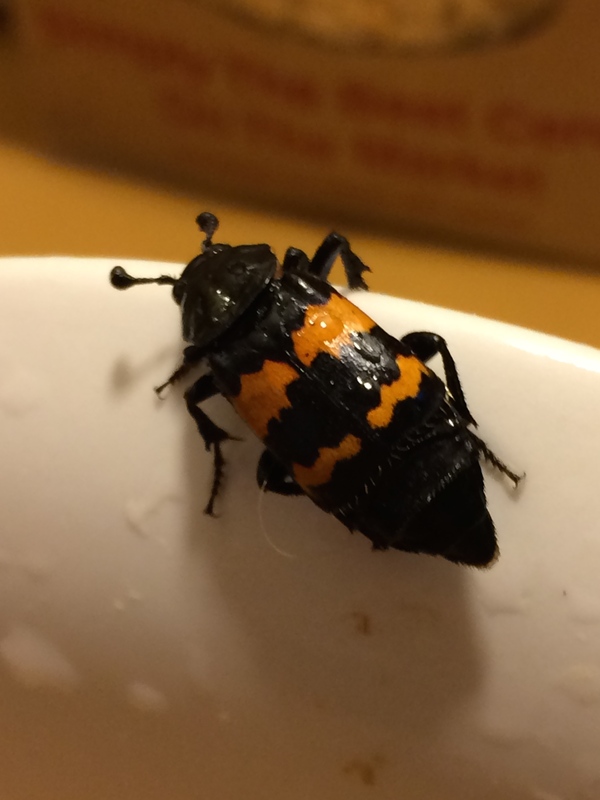 This handsome beetle popped out of an empty cat food can in my sink. We had gone to Columbus, Ohio, for a wedding, leaving Rex Fernandez the cat in the care of an expert cat sitter who left the nearly empty Fancy Feast cans in the sink as requested. Upon tidying up I encountered this large, dramatically colored beetle. I was surprised but not horrified. As most naturalists would, I decided to photograph it with my iPhone for identification. Darwin, famously, put a beetle, or was it two, in his mouth for safekeeping to carry home for study, because his hands were full with specimens and equipment. I had just acquired Insects of New England & New York by Tom Murray, so it was a simple matter of flipping through pages of photographs of beetles to find one like this. 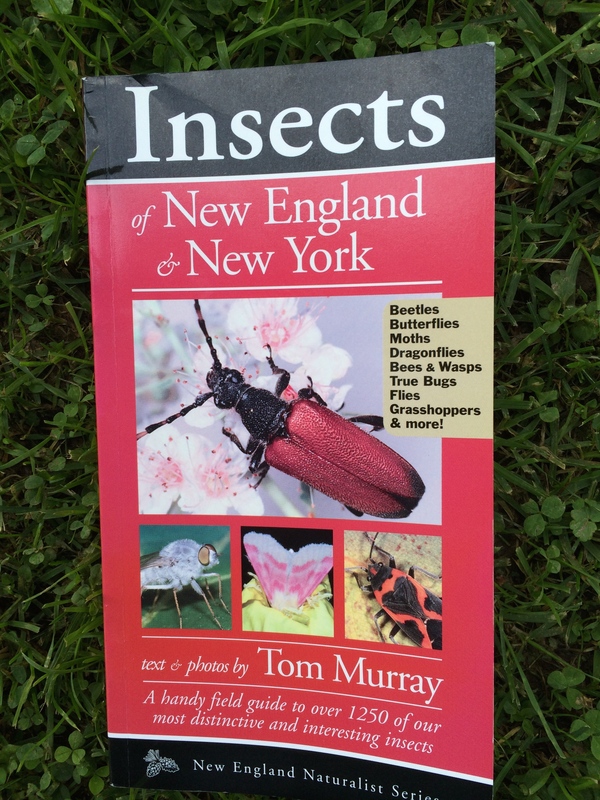 Insects of New England and New York by Tom Murray, published by Kollath + Stensaas Publishing. That’s how life continues, by not wasting available resources and good parenting. I narrowed from genus to species. It looked exactly like the photo of Nicrophorus defodiens in Murray’s book, which I stumbled upon online as well. These beetles get around. One comment beneath the online photo indicates they are a pest on the Isle of Skye in western Scotland, or I should say a wee pest (the go-to lingo of the Scots). I am sure that I could not put this kind of beetle in my mouth. And then in further tidying I discovered a note and a container from the expert cat sitter by the telephone. The Wegman’s Olive Bar container had beautiful little holes in the lid and nothing in it at first view. Near some shredded leaf parts I saw a tiny, very tiny as she had said, fuzzy little bug. Higher magnification of Susan’s bug. Note the widened “flanges” of the hind legs. I went off on a wild goose-bug chase. The chances of ID-ing such a tiny bug, especially one that appeared to have been rolling around in gooey dust seemed futile. I observed it, photographed it, and then let it go because I didn’t want it to die while I was on my chase. The hind legs were distinctive. I immediately thought of leaf-footed bugs, known for “leaf-like expansions” (Murray) of their hind legs, and a photo in Murray’s book of the Distinct Leaf-footed Bug (Merocoris distinctus) bore some likeness. 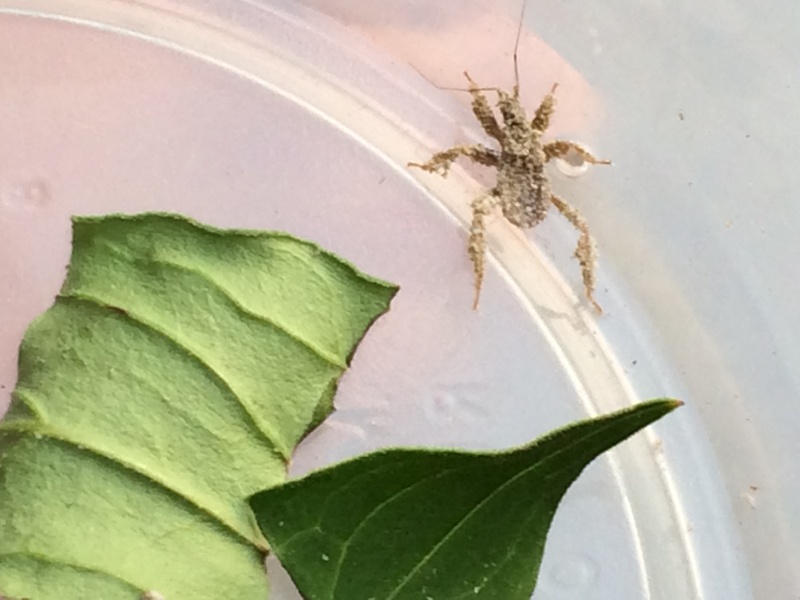 Murray’s description reads: “These little, fuzzy bugs can be found on flowers throughout the eastern U.S., except Florida where M. typhaeus occurs.” Susan said that she had found it on her shower curtain, but this unusual location did not necessarily rule out the Distinct Leaf-footed Bug because bugs get around for various reasons. Such a tiny bug could have blown on a gentle breeze from one of the flowers in her garden to her shower curtain, possibly. I wasn’t satisfied, however. The Distinct Leaf-footed Bug was supposed to be 9 mm or so, and Susan’s bug was smaller I thought. But perhaps it could be just a nymph, an immature stage in maturation of insects. It would get bigger and then look more like the photo in Murray’s book perhaps, especially if it was cleaned up. But that line of thinking was definitely fuzzy. I puzzled on. Browsing around online, googling search terms like “tiny, fluffy bug” or “tiny, fuzzy bug” or “tiny, sticky bug,” I can’t remember exactly, I stumbled on Doug Green’s Simple Gifts Farm (www.simplegiftsfarm.com) with a great photo of a lookalike. 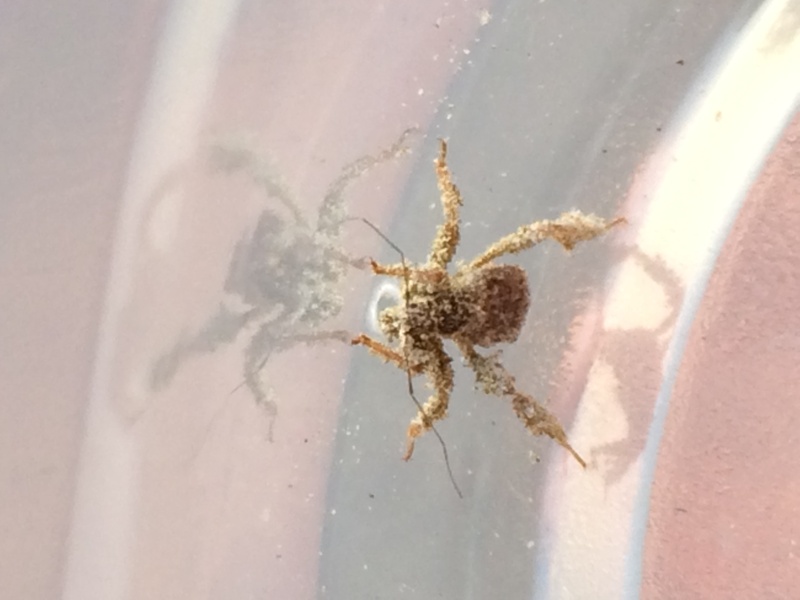 You have to scroll down past the wooly aphid to get to the photo of the nymph of the Masked Hunter Bug (similar to Susan’s bug). The fascinating little creature on the shower curtain was a member of the Assassin Bug family, specifically Reduvius personatus. Called Assassin Bugs, because they hunt and kill other bugs, they like to be indoors and can, if disturbed, inflict very painful bites upon humans. The Masked Hunter is so-called because the nymphs go around covered in dust as a camouflage. The adults are not half as fascinating looking, as shown on Michigan State University’s webpage, written byHoward Russell, who notes that they have a “sizable beak” with a “needle-like mouthpart.” I am more entranced by the Masked Hunter with its costume of dust. My third identification adventure occurred in a coffee shop. I was sitting with my portable, paper 2014 Edward Gorey’s The Evil Garden Calendar (Pomegranate) open and my coffee, plotting to get my life in order when a beetle dropped onto the page. I had been immersed in beetles and bugs, and here was another one begging for attention. Had it dropped off the ceiling? my hair? At least it wasn’t an assassin bug. It seemed cheerful and actively explored my page. The pattern on the back was interesting but not outstandingly helpful. 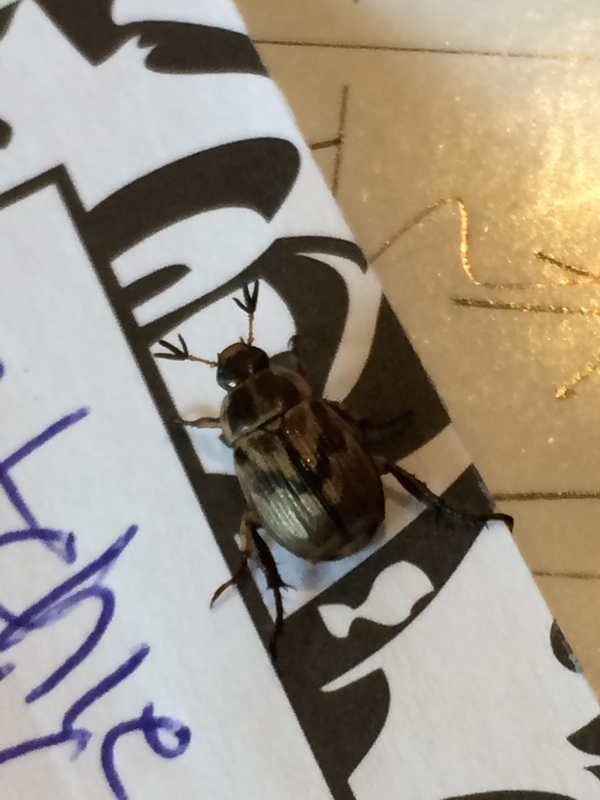 After escorting the beetle outside to an ornamental planting by the parking lot, I started looked through all beetles that had three-pronged, black antennae. There were a lot. 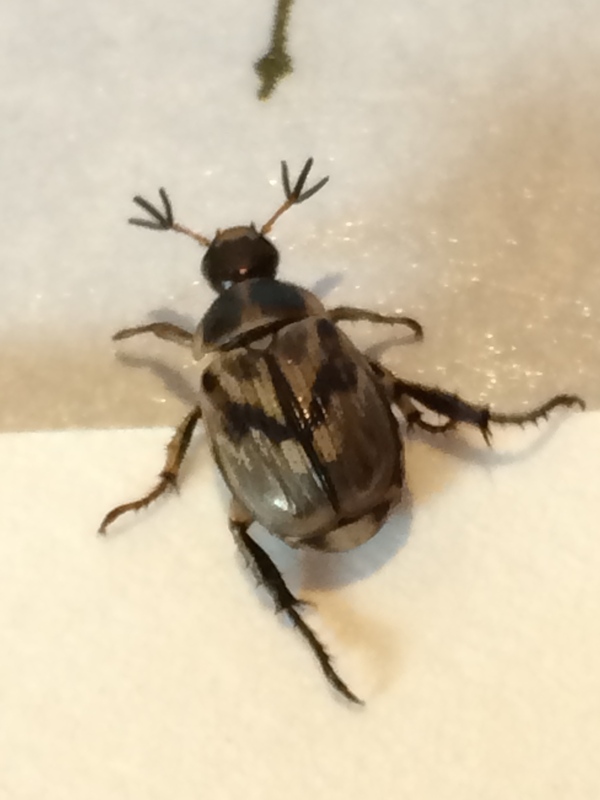 I narrowed it down to some type of scarab beetle, and after much wandering among beetle photographs decided that it was mostly likely the Oriental Beetle, Exomala orientalis (synonym Anomala orientalis). My photographs match those on bugguide.net almost exactly. Various accounts point out that the pattern often varies this way and that (i.e., no two snowflakes are alike), and sometimes it is completely black, as shown in Murray’s book. It is an immigrant from Asia, and frequents rose and hollyhock blossoms. The grubs live in the ground and feed on turfgrass roots. In graduate school I took courses that gave me practice in some of the arts of identification–Agrostology, the study of grasses, at the University of Texas at Austin, and Entomology, the study of insects, at Cornell. It’s not so much the name per se that a naturalist seeks, but knowing and honoring the individual through seeing well–discriminating between details of appearance with appreciation. I cannot fly around the world like David Attenborough, but I can engage in adventures that everyday life presents, and they are nonstop. I found a wonderful website called Beetles in the Bush created by entomologist Ted MacRae. He posted ID Challenge # 23on July 12, 2014. I was too busy investigating my own challenges to undertake his challenge, but I urge readers to get involved and accept challenges. For example, here is a long-legged insect that I found ensconced on peony fruit capsules in my Secret Garden. 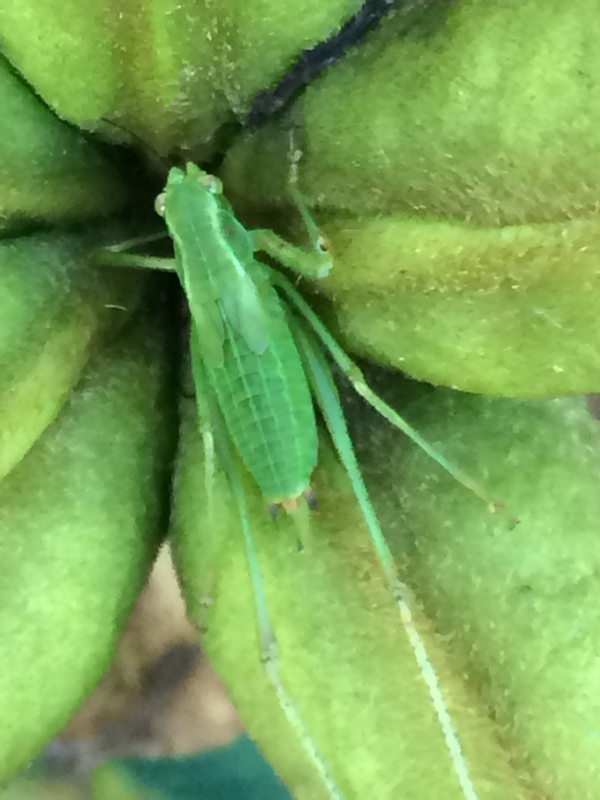 Long-legged green insect on peony fruit capsules. 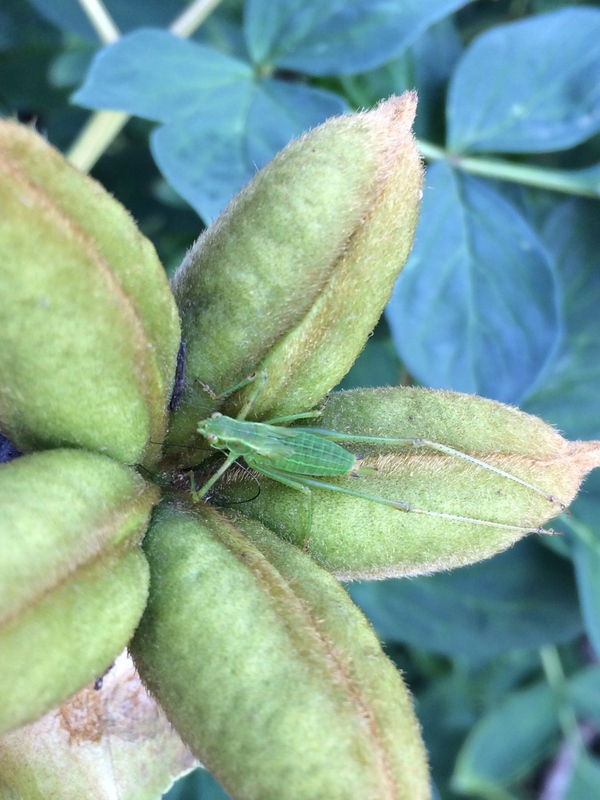 I think it is a katydid. The challenge is what kind of katydid? 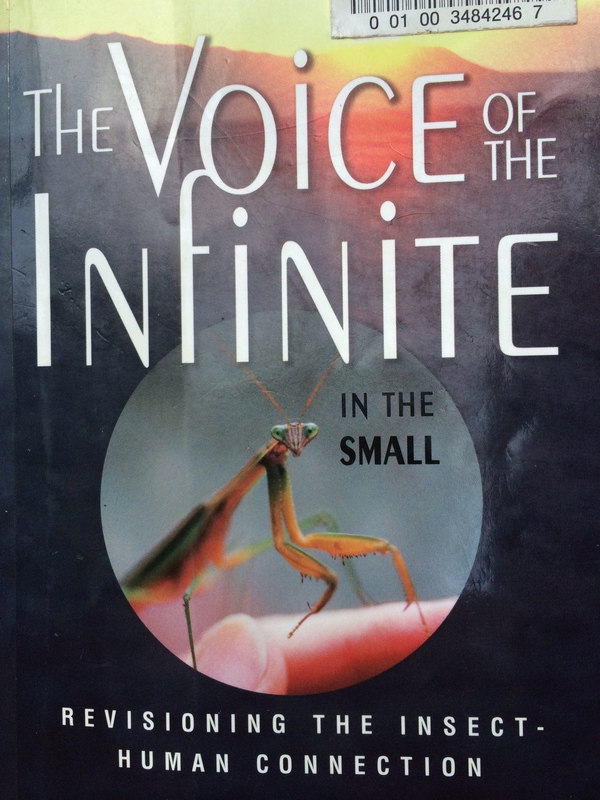 I also pose this challenge in the spirit of the “revisioning the insect-human connection,” the subtitle of a wonderful book by Joanne Elizabeth Lauck titled The Voice of the Infinite In the Small. This is a beautiful book about tuning in to our smallest brethren and shedding human self-centeredness in order to really belong to the delicate lace of life on planet Earth. I for one feel that my life is more in order when I try to identify my fellow life forms. A classic: The Voice of the Infinite in the Small: Revisioning the Insect-Human Connection by Joanne Elizabeth Lauck.